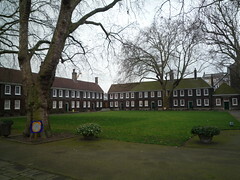 The Geffrye Museum (in Shoreditch) was a former almshouse for elderly residents and now converted into a museum.The museum focuses on the changing face of the British middles classes from the 1600s to today. 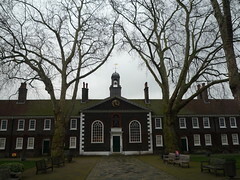 The Geffrye explores this theme by looking at the living rooms of these periods. These feature authentic re-creations or antique wall fittings, furniture and an array of other objects used by the people of the time. Before each room there’s a description of the changes that have faced society and its influence on the architecture and design. Part of these summaries include a touch and feel component looking at topics like fabrics and woods. The Geffrye also includes a restaurant with traditional and modern English food, walking past it smelt quite nice but I didn’t have time to try it out. The museum also features a small gallery space for community exhibits, when I visited it featured conversations with several residents discussing what influenced their home decorating. Lastly, the museum has a large grass garden in the front and a herb garden at the back. I couldn’t access it but presumably it’ll re-open when they’re in bloom and hopefully aromatic as well! As a side note the residents and the functions of the rest home were relocated due to the increasing levels of industry surrounding the house at the turn of the 20th century. The museum is free, which is a plus, but I wouldn’t necessarily recommend it unless you have an interest in home design. It’s an excellent museum and popular with anyone who has an interest in how we once lived, not only to those with an interest in home design. It is a wonderful place to take children. The restaurant is also quite as good as you thought it might be. That’s good to know, thanks! I imagine the herb garden must be quite nice too when it’s in bloom.